Dropping into stores and online this fall, DropMix is a dynamic and fast-paced music-mixing game that Hasbro developed in collaboration with legendary game developer Harmonix Music Systems, Inc. ( as in, the guys behind Rock Band and Guitar Hero). The game is a competitive experience that blends physical and digital play to give players a fresh way to combine their favorite songs and discover new ones by playing cards on a game board connected to a mobile app. Our own Gavin Sheehan checked out DropMix back at E3 and absolutely loved it, so you know its got to be at least interesting. And to celebrate the game’s imminent launch, Hasbro and Harmonix are planning a special giveaway for attendees of PAX West (the con formerly known as PAX Prime). 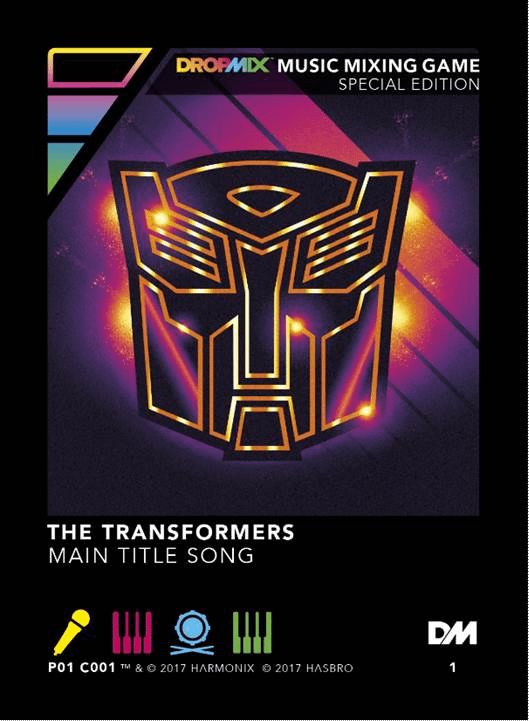 All con-goers at PAX will have a one-of-a-kind opportunity to pick up an exclusive DropMix ‘Transformers Theme Song’ song card that will allow DropMix players to “roll out” new and interesting music mixes featuring the classic theme song. So wether you’re a Transformers fan, a collector who adores exclusives, or someone dying to try out DropMix, this is a pretty solid opportunity.